When this option is active the function of the Home key becomes dependent on the number of times Home has been pressed. When Home is first pressed, the text cursor is moved to the beginning of the current line. When Home is pressed again, the cursor is moved to the first line in the window. When Home is pressed a third time, the cursor is moved to the first line in the file. If the Home key is not assigned to Start of Line, Home-Home-Home functionality becomes unavailable. Its function is tied directly to the Home key, and not to other keys which might be assigned to Start of Line. When this option is active the function of the End key becomes dependent on the number of times End has been pressed. When End is first pressed, the text cursor is moved to the end of the current line. When End is pressed again, the cursor is moved to the last line in the window. When End is pressed a third time, the cursor is moved to the last line in the file. If the End key is not assigned to End of Line, End-End-End functionality becomes unavailable. Its function is tied directly to the End key, and not to other keys which might be assigned to End of Line. Use this option to permit the text cursor to move from the start of the current line to the end of the previous line when the Left Arrow is pressed. When this option is inactive, pressing the Left Arrow in column one will result in no cursor movement. Use this option to force the text cursor to move from the end of the current line to the start of the next line when the Right Arrow is pressed. When this option is inactive, the cursor is allowed to travel rightward past the end of a line. This option also affects the way Boxer behaves when the Up Arrow and Down Arrow are used to cursor across lines of varying lengths. If this option is active, the column of the text cursor will be adjusted when moving onto a line that is shorter than the current column. 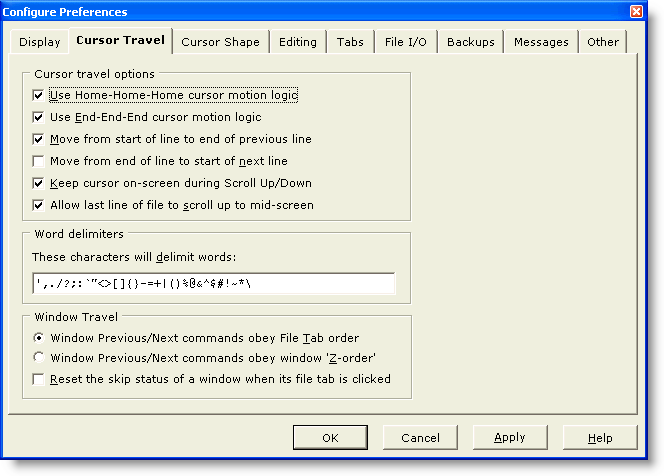 If this option is inactive, the text cursor column will be maintained when moving from line to line. Use this option to control how the position of the text cursor is treated when using the Scroll Up and/or Scroll Down commands. When this option is checked, the text cursor will be moved (if necessary) to keep it on-screen while scrolling. When this option is not checked the cursor position will be maintained even when the line containing the text cursor is scrolled outside the view of the window. When this option is on, using the Down arrow to scroll to end of file will cause the last line of the file to appear as high as mid-screen. When this option is off, the last line of the file will not scroll up past the bottom of the window. This option can be used to designate the characters which are considered to be word delimiters. Word delimiters are those characters which serve to separate one word from another. It may be desirable to add or remove symbols from the default delimiter list in order to improve the behavior of the Word Left and Word Right commands within certain types of file. The word delimiter list is used by various commands to determine the extent of their operation. Among these commands are Word Left, Word Right, Delete Previous Word, Delete Next Word, Swap Words, Open Filename at Cursor, Open URL at Cursor and Open Email at Cursor. Use these options to control how Boxer responds to the Window Previous and Window Next commands. When File Tab order is selected, the window commands will use the ordering of the File Tabs to determine which window to move to. When the Z-order option is selected, window movement will be determined according to an order maintained by Windows. A window is promoted in the Z-order when it is made current. Less frequently used windows will gradually fall to the bottom of the z-order. When this option is on, clicking on a file tab will cause its skip status to be reset to normal.